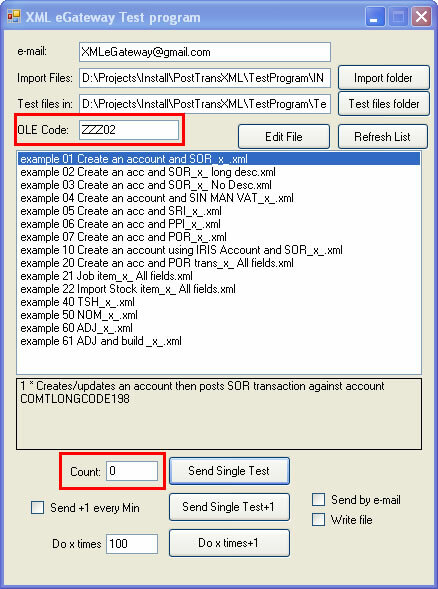 The XML eGateway Test Program was developed for testing XML eGateway (XML eGateway on line manual) but is shipped because it has many examples showing how to import various types of transactions, using various features and options. This program can also be used to aid test your own XML files for importation. The XML eGateway Test Program lists all files in the “TestFiles” sub directory of program. These are simple text XML files, which can be edited using notepad. They are numbered to group them into categories, and work with “Electrics R Us” company. Examples 1-9 all create/update an account, using an external reference, and then post a transaction of various types. Examples 10-19 all create/update an account using an Exchequer Account code, and then post a transaction of various types. Examples 20-29 create/update Account, Stock and Job records using every available field for testing. Examples 40 post ADJ, NOM’s and TSH Time sheets. These can be viewed either by selecting one from the list and pressing [Edit file] button, or pressing [Test file folder] button. To create your own simply copy and rename, then press [Refresh List] button. Depending on the two tick boxes, “Send by mail” or “Write file”, pressing [Send single test] button to submit the selected test file by selected method. The <test> section of the test file is used by the test program, and ignored by the XML eGateway. Various strings are also replaced with data. Count. Pressing [Send Single Test + 1] increases this count. This allows you to repeat an import with diferanent referances or accounts. Marked in red above. OLE code entered on the main window. Marked in red above.